I read about america’s worst mom when she became famous last year. She has a book out. The media dubbed me America’s Worst Mom (Go ahead, Google it.) But that’s not what I am. Childhood really has changed since today’s parents were kids, and not just in the United States. Australian children get stared at when they ride the bus alone. Canadian kids stay inside playing video games. 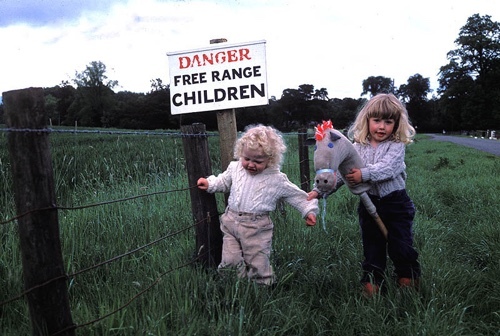 After I started a blog called Free Range Kids, I heard from a dad in Ireland who lets his 11-year-old play in the local park, unsupervised, and now a mom down the street won’t let her son go to their house. She thinks the dad is reckless. If this is America’s worst mom, I had the worst mum in England. She made fun of me when I was 10 because I wouldn’t take a two mile bus ride to the doctor’s on my own. Lucky it wasn’t America because the police would’ve nabbed me. A couple of years ago an older couple accosted me in The Good Guys because I had left my kids watching the big screen TVs while I looked for a stereo. Who knows who might’ve snatched my urchins away in the 4 minutes that they were alone. Mostly, the world is safe. Mostly, people are good. To emphasize the opposite is to live in the world of tabloid TV. A world filled with worst-case scenarios, not the world we actually live in, which is factually, statistically, and, luckily for us, one of the safest periods for children in the history of the world. Like the housewives of the 1950s, today’s children need to be liberated. Unlike the housewives of the 50s, the children can’t do it themselves. Though I’d love to see hordes of kids gathering for meetings, staging protests, and burning their baby kneepads and maybe they will, it is really up to us parents to start renormalizing childhood. That begins with us realizing how scared we’ve gotten, even of ridiculously remote dangers. Locking children away is cruel. Be free, little children! Be free! I agree with this so much. When I was a kid I was riding my bike a mile to school at 8 years old. I was allowed to play at that same age a quarter of a mile away at the creek, you know, where there is water and rocks that could kill me! Nothing happened to me. I learned about the big bad world, I saw nature, I learned how to use crosswalks, I learned how to use buses on my own on a whim to go travel to the mall. I rolled around in the mud and swam in the water catching crayfish. I made forts out of sticks and jetsam. My parents did not seem to have that irrational fear that could have kept me cooped up inside, I was just told when to be home. I got sick less than other kids. My mother said it was because they let us play in the mud and not turn into plastic bubble kids. The way I see parenting conducted now is really based on fear. One article about the dangers of pacifiers and hundreds of thousands of parents are throwing away their baby pacifiers in disgust and frowning on those who would continue to use them. A 10 year old kid walking around alone creates suspicion because we are not used to seeing it because someone somewhere on some news channel started saying that was a sign of irresponsible parenting. Agreed. Not sure if I’ll still agree when Ben’s old enough for it to make a difference, but I hope so. Previous Previous post: Pee Anywhere?